In the 1970’s MULT/DIV instructions were fairly uncommon to be implemented in hardware on a processor. They were implemented in software (usually be the compiler, or hand coded) as a series of adds and subtracts/shifts. In some cases dedicated hardware, usually through a series of bit slice processors, or ‘181s were added to handle MULT/DIV requirements. In 1978 RCA announced the CDP1855 Programmable Multiplier/Divider for the 1802 COSMAC processor. Sampling began in 1979, making this one of the earliest ‘math coprocessors’ of the time. The 1855 was an 8×8 Multiplier/Divider, handling Multiplies with Addition/Shift Right Ops, and Division using Subtractions/Shift Left Ops. 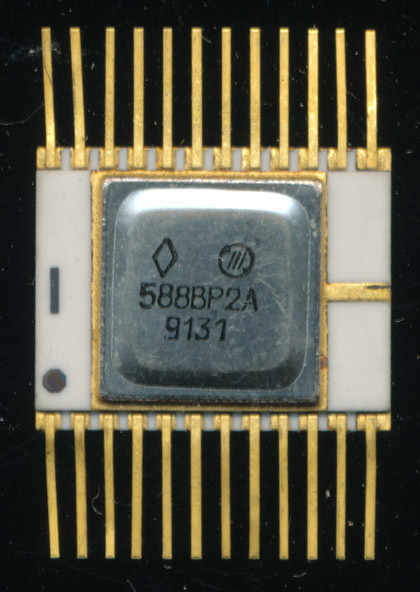 It was, like the COSMAC, made in CMOS, and at 10V ran at 6.4MHz, allowing for a 8×8 MULT to finish in 2.8us. The CDP1855 was also designed to be cascaded with up to 3 others, providing up to a 32×32 bit multiply, in around 12usec, astonishing speed at the time. Even the slower CDP1855CE (using a 5V supply and clocked at 3.2usec) could accomplish a full 32×32 MULT in 24usec. An AMD AM9511 (released a year earlier) can do a 32×32 fixed point multiply in 63usec (@ 3MHz). 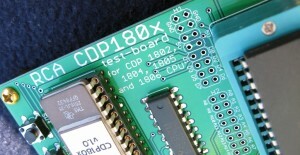 The CDP1855 was designed to interface directly with the 1802 processor, but could be used with any other 8-bit processor as well. It was programmable, so the host processor only needed to load with the data to be multiplied/divided, the control values ot tell it what to do, and then wait for the results. As was typical, the Soviets made an ‘analog’ of the CDP1855 called the 588VR2 and 588VR2A. The 588VR2 was packaged in a 24-pin package vs the 28 pins of the CDP1855, so its certainly not directly compatible. Soviet IC design houses were instructed and paid to design and make copies of Western devices, typically original ideas were discouraged. This led to a lot of devices being made that were similar, but not the same as their Western counterparts, the design firm could make a somewhat original device, and then simply claim to the bureaucrats that it is an ‘analog’ to a certain Western design. Thus the 588VR2 is ‘similar’ or an ‘analog’ to the 1855. The CDP1855 continued to be made, and sold into the late 1990s, much like the 1802 processor it supported. The CPU Shack’s list of test boards continues to grow. Today we now have available a board for testing RCA COSMAC processors including the CDP1802 1804 1805 and 1806. These early CMOS processors are still being made 40 years after their introduction in 1975. Being a CMOS design, the boards are a bit simpler to make (simpler power supplies) and thus a bit less expensive. They are in stock and shipping now for $89.95. You can Order them on the RCA180x Test Board page. 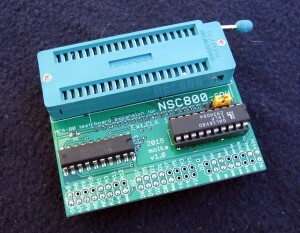 Also available are new expansion boards for the MCS-80 boards. In addition to the Zilog Z80 and Intel 8085 expansions, an expansion is now available for the National Semiconductor NSC800. Introduced in 1979 this CMOS processor is a hybrid of the Z80 and i8085, taking features of both to greatly enhance the Z80 architecture. These expansions are available at the same price as the previous ones, $29.95 with FREE Shipping. They can be ordered from the MCS-80 Expansion page. All of these systems are pretty interesting designs, however we are going to take a peek at the RCA Studio II. This was RCAs try at the video game console market that was emerging in the 1970s. It sadly was outclassed soon after its introduction by the likes of the Atari 2600 and was discontinued after a mere 2 years. 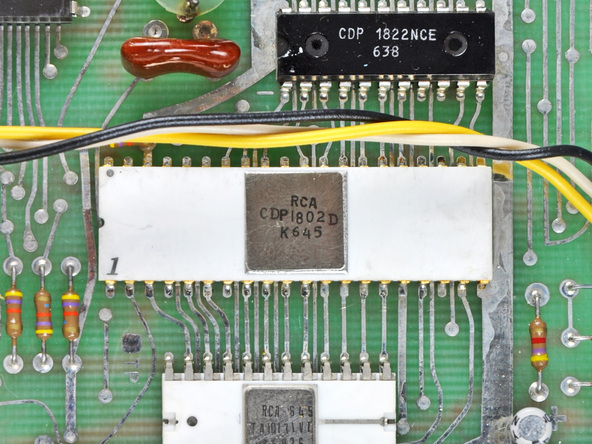 At the heart of the Studio II was a CPU that RCA developed in 1976, a CPU that has outlived the Studio II, and many many other consoles, in fact the RCA COSMAC 1802 (the single chip implementation of the 2 chip 1801) is still made today by Intersil. Today the 1802, due to its flexible 16×16 register design, and well known reliability in harsh environments lives on in dozens of satellites circling the Earth. 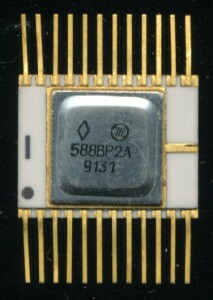 It was also used as the main computer (6 1802s actually) in the Galileo deep space mission to Jupiter. Many of the CPU’s designed in the 1970s (and often used in video games of the time) still are made (by Intersil now) and used today. THe 1802, 6502, PIC16, and 2901 to name a few. So next time you enjoy the weather report, or watch some satellite TV, its likely that a CPU designed over 35 years ago is being used to get that content to you.